Rock candles attract many buyers because they are attractive, personalized, and are original.These candles consist of a flame burning in a small hole in the center of a slab of rock. Usually, the rock is decorated with a personal message, the owner’s name, special symbols or even pictures of beloved pets. Although makers require special equipment to drill through and decorate the rock slabs, putting them together is simple. All you need are a few supplies that often come in a kit. A glass bowl is important for holding the oil that fuels the candle flame. Unlike other candles, rock candles use liquid wax and require the glass bowl as a reservoir. The bowl needs to be wide enough and strong enough to hold up the rock slab that surrounds the wick. The best glass bowls for these candles are deep, wide and thick. Pyrex or other industrial glass bowls work well. These bowls are usually clear because they are invisible under the rock slab, but any color will do so long as the structure is sound. The oil in these candles is actually liquid paraffin. Unlike kerosene or gas, liquid paraffin has a low flashpoint. It does not harden like other types of wax and is available at candle making shops. A wick tube contains the wick as it passes through the hole in the rock slab. It prevents the slab from scorching and helps keep the flame from going out. This tube is a clear glass cylinder about ¼ inch wide and several inches long. It has a small glass lip running around it about 1/8 inch from the top of the tube. Beneath this tube sits a little metal ring that prevents the glass lip from scratching or breaking on the rock. Wicks for rock oil candles are thicker than typical candle wicks. They consist of many linen threads woven together into thick cords, similar to the wicks for kerosene lamps. 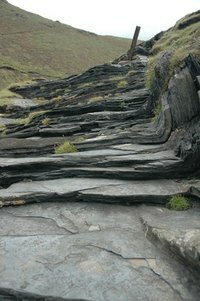 Slate is the most common rock for making rock candles. It is sturdy and shears naturally into thin, manageable slabs that are easily shaped and drilled. Candle makers can drill these rocks at home with a rock drill bit available at most hardware stores. The hole for the wick should be drilled into the exact center of the slab while smaller ventilation holes need to be drilled about 3 inches from the center hole at a diagonal. Two holes on each side of the center hole form a V.
Use your electric oil burner to scent your home with the personalized fragrance oil blends you've made yourself.